Review: Three men shelter from a storm, they discuss an incident where a bandit raped a woman whose husband then somehow died. The story is told from four different perspectives. This is the film that introduced western audiences to Japanese cinema. Just the way that the camerawork is used and the way that the whole film is filmed is amazing. I never once got tired or even had a minute to look at what time it was. The film kept on moving. Both Toshiro Mifune and Machiko are superb as husband and wife. 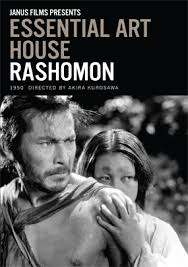 It is the work of Akira Kurosawa that brings the whole film alive. During the filming of this the cast approached the director and asked what the meaning is of this film. The reply that they got was that it is a reflection of life, and that life does not always have clear meanings. Two of the main themes in this are passion and also absolute truth. At the Academy Awards in 1952 this won the Oscar for the Honorary Award (Japan. Voted by the Board of Governors as the most outstanding foreign language film released in the United States during 1951). I was disappointed to find that the Rashomon Gate had completely disappeared when I went to Kyoto….